The genetic etiology of neurodevelopmental disorders has proven elusive due to the substantial phenotypic and etiological heterogeneity of their common forms. Developmental language disorders affect approximately 7% of children and are associated with negative outcomes in a multitude of domains, including social, emotional, behavioral, and academic functioning. Yet, with the exception of several reported monogenic cases, they are severely understudied with respect to their genetic bases, as the field is effectively only entering its 'GWAS era'. One of the possible solutions is to reduce the supposed phenotypic and locus heterogeneity by studying special populations such as genetic isolates. Taking this approach, Dr. Sergey Kornilov and Dr. Elena Grigorenko's team at Yale University performed a genome-wide association and whole exome sequencing study of members of a unique geographic Russian-speaking isolate, characterized by an unusually high prevalence (i.e., around 30%) of neurodevelopmental disorders of speech and language. On one hand, the GWAS results suggested that at least part of the multivariate language disorder phenotype in this population is associated (surviving corrections for multiple testing) with variation in the SETBP1 gene. On the other hand, the WES revealed multiple potentially damaging exonic variants in severely affected probands in other genes that play a role in neural development. GWAS and WES converged on a new candidate pathway that is potentially affected by common as well as rare variation in this population. Preliminary follow-up studies using neural endophenotypes corroborated these findings by implicating SETBP1 in the atypical development of language-related cortical networks and highlighting it as a novel candidate language disorder gene. 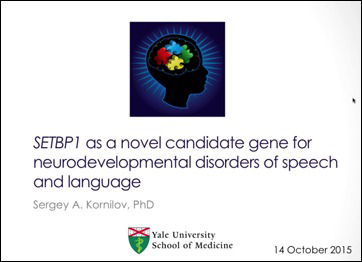 In this webcast, Dr. Kornilov will delve into his team's GWAS and whole exome sequencing studies surrounding the neurodevelopmental disorders of speech and language in the unique, Russian sample set. Dr. Sergey Kornilov is an Postdoctoral Associate in the Child Study Center at Yale University School of Medicine. Dr. Kornilov earned his MSc in Educational Psychology at Moscow State University and his PhD in experimental Psychology at the University of Connecticut. Currently, Kornilov is part of Dr. Elena Grigorenko's lab at the Yale Child Study Center which performs research and clinical services focused on behavioral and molecular genetics.